A practical, behind-the-scenes look at nearly everything I’ve learned — so far. You have ideas. Amazing, beautiful, useful ideas. When you talk about them, you get visibly excited and people listen. You can imagine standing on stage and receiving a standing ovation for having delivered the best possible presentation of your ideas. You… a thought leader. You’ve never really been on stage — and the thought is terrifying. You’ve never put together an hour-long presentation. You don’t even know where to begin or how to think about it. The biggest thing you feel is anxiety. You’re not alone. Every speaker has felt that anxiety. I’ve certainly been there and this article represents all the tips, tricks and advice that gave the confidence to keep improving. Everything I’ve shared below is based on notes that I took over a few years when public speaking became a focus for me. It is, at heart, about the process and practice of developing talks and being a speaker. This article is not about slide design, content or storytelling. This article is not about stage performance or voice control. The nitty-gritty details that go into being a confident, prepared and professional public speaker. I know. It’s a lot. But it has pictures. And it’s real. I never really set out to be a professional speaker. But here I am writing this article in an airport on my way to a keynote speech in Chicago. In a few days I’ll go to Atlanta and the next week, California. And that’s okay. For the first time in my life, I’m psyched for this kind of speaking schedule. Like so many people, I get excited about sharing ideas. But sharing them publicly, on stage, was a different story. I dreaded public speaking. Each event hung in the calendar like a black hole, sucking in my time and attention. As each event approached my anxiety and self-consciousness grew. But I felt compelled to do it. Sure, I could have said “no” to speaking invitations and been on my merry way. But I couldn’t. I knew deep down that there was only one real reason for declining speaking opportunities — and that was fear. Fear of failure. Fear of performing. Fear of a loss of respect. Like so many things worth doing, speaking can be scary. At the same time, I was concerned about speaking being a distraction. My primary focus is Common Craft, a company I founded with my wife Sachi and it requires most of our time and attention. But then things started to change. In 2012, I wrote a book called The Art of Explanation based on our work at Common Craft. Soon after, I was asked to speak with increasing regularity and started earning modest speaking fees. Slowly my speaking became a bigger priority. I started to read books about speaking and spent some time with a coach. For the first time, I started to feel the anxiety wither. Most importantly, I developed a process for conceiving, preparing and executing talks. The more talks I prepared for, the more I learned about the process and the more I saw that public speaking is not an event that comes and goes. I now see it as a career-long quest, something that I will always strive to improve. While I’ve truly become a public speaker over the last few years and learned a lot, I’m still learning all the time. I’d like to share a number of things I’ve learned so that you may be able to make this transition too. Note: As I mentioned previously, my focus here is not the content of presentations. Slide design and presentation structure, strategy etc. is an art in itself. For that, I’d recommend books by experts like Nancy Duarte (Slide:ology, Resonate) and Garr Reynolds (Presentation Zen). Their books will give you solid advice on style and content among other things. My focus here is process and practice. This is a behind-the-scenes look at nearly everything I’ve learned as a public speaker. 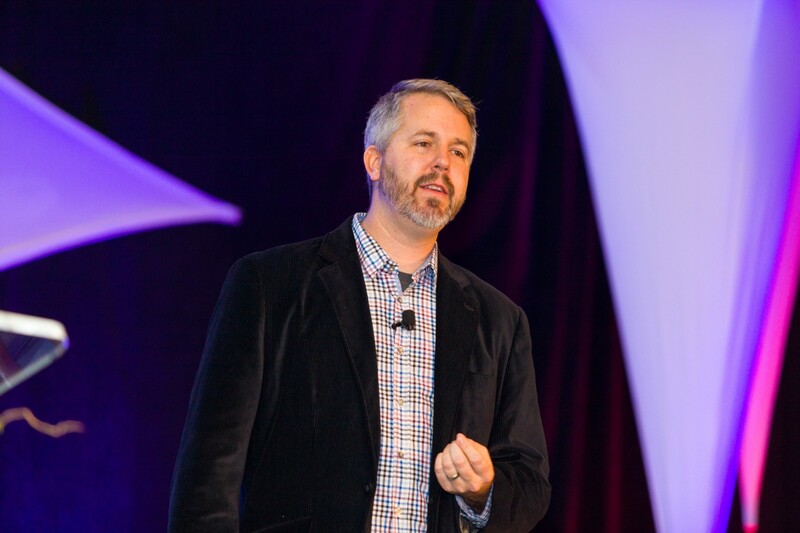 Early in 2015, I decided to develop a completely new 45-minute keynote-style talk. I would use some of the same points of previous talks, but rethink the entire structure and examples. Leading up to this point, both Sachi and I were always on the lookout for content. I love playing media in my talks and every time I listened to a podcast or watched a TV show, I would look for examples for my talk. A post by Jason Kottke pointed me to a video that explains the differential gear that has become a reliable part of my talks. Sachi pointed out an excellent analogy on an episode of This American Life called Back to School. I’m always thinking about the talk and looking for inspiration from the world around me. I keep an ongoing list of ideas in my Wunderlist app and look for ways to integrate them. In this way, I’m always preparing, always trying to find the next big idea that an audience will love. The best talks are organized talks and organizing starts early in the process. For my new talk, I used a process that I learned in writing my first book. At the beginning, The Art of Explanation was just a lot of ideas and I needed some way to visualize and organize them. Thankfully, Dan Roam, Author of “Back of the Napkin” and other books took the time to give me great advice on organization. 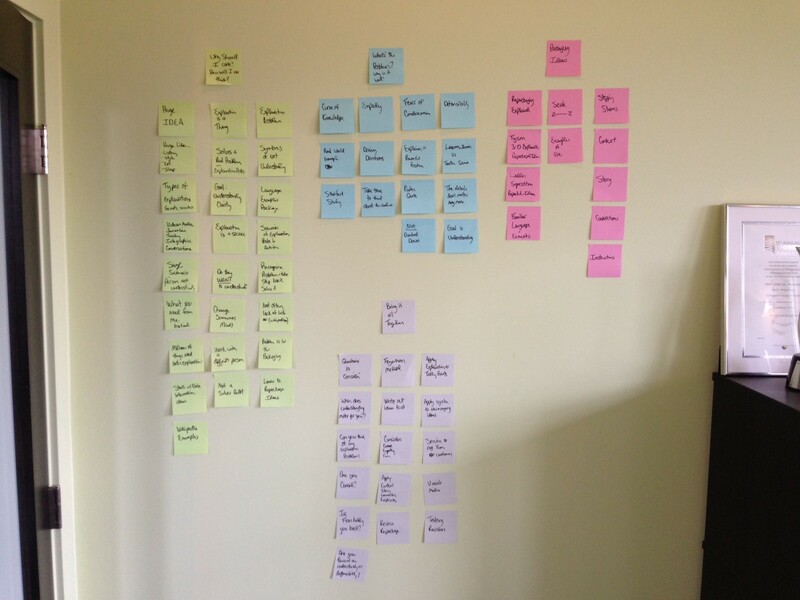 He encouraged me to find an open wall and lay out every major point in the book on the wall with post-it notes. At first it can be a brainstorming exercise — just generate a lot ideas. Then, group them according to the major points you’ll make. This is an essential exercise in the process of conceiving and planning a new talk because it creates a backbone for the entire talk. With the big ideas in place and organized, I needed to define what I would say and how long it would take. My goal was a 45-minute presentation. To write a script, I used some simple math based on our video work. When we record voiceovers for Common Craft videos, 480 words equals about 3 minutes (I’ll round up to 500 words here). If I generally speak at that rate in a presentation, it’s possible to estimate what word count I would need for a 45-minute talk. For me, that was about 7,500 words. So I set my goal at a 7,500 word script and wrote out everything I could based on the wall of post-it notes. Writing out an entire talk seems painful, but I promise it will help you stay organized and be thoughtful of the examples and phrases you use. Once the content feels good, it’s time to move to visuals. My slides are nearly 100% visual and predominantly made using Common Craft Cut-outs. They are designed to look like Common Craft videos. In fact, I take pride in the fact that my presentations don’t look like they came from a marketing department. To get the visuals down, my first step is to open PowerPoint and create a bunch of blank slides. Then, I go through the script and add sections of the script to each slide, either as slide titles or notes. Eventually the entire talk exists on dozens of slides in a single presentation with no visuals (yet). Then, I print out the whole thing. This creates a hard copy of the presentation with words but no pictures. 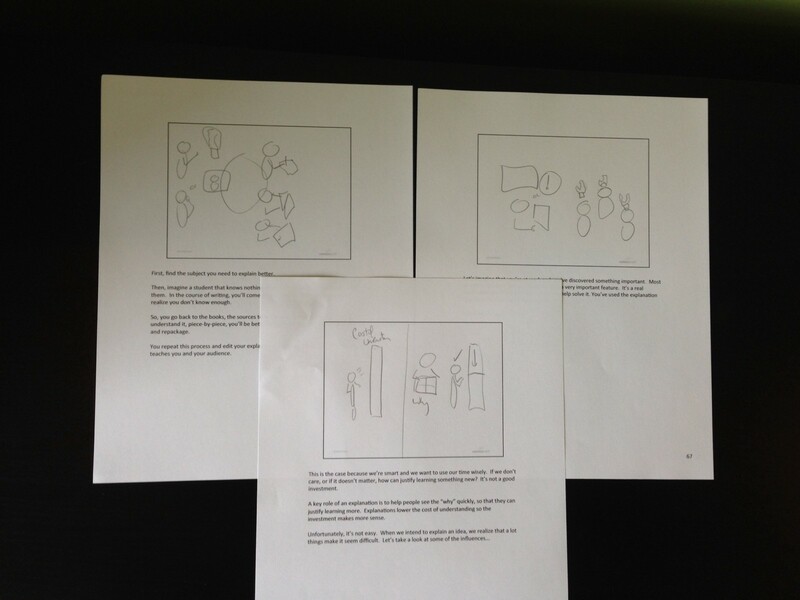 Then, I draw basic thumbnail sketches on each slide to develop ideas for that point. From here, it’s only a matter of creating the visuals based on my sketches. For me, this means searching Common Craft’s library of Cut-outs or making new ones for each scene. I also use simple shapes and a bit of text via PowerPoint tools. You can also consider licensing images or the use of media in the public domain. Wikipedia has a big list of sites that offer public domain photos and illustrations. Pixabay offers a huge library of photos and illustrations that are free to use. WPClipArt is designed for students and offers copyright-free drawings and images. Open Clip Art All public domain clip art. Once the final script and visuals are in place, the presentation is almost done. Because I used word count to establish the duration, I have some confidence that it will be close to what I need. The next step is to take the new talk for a spin. Public speaking is one of those experiences that cannot be replicated outside of doing the real thing. Standing in front of hundreds or thousands of people and talking for an hour can be terrifying, but it gets better, I promise. Every time you step on that stage, you learn something new. It builds your confidence like nothing else can. There is no replacement for performing and if you want to get over your fear, you simply have to do it and do it and do it. But there is another kind of practice that helps immensely. That is practicing at home. Scott Berkun’s book “Confessions of a Public Speaker” drives home this point clearly and with Scott’s ever-present sense of humor. I know I look like an idiot practicing my presentation in my underwear at home, talking to a room of imaginary people. When I practice in hotel rooms, which I often do, I’m worried that at any moment the maid will barge in mid-sentence, and I’ll have to explain why on earth I’m lecturing to myself in my underwear. But I’d rather face those fears in the comfort of my own room — with my own minbar, on my own time, over-and-over as many times as I wish — than in front of a real crowd, a crowd that is likely capturing my performance on videos and podcasts recording what I’m doing for all time. There are no do-overs when you’re doing the real thing. In all things the way you practice defines the way you perform. It’s selfish to make an audience endure your first or even third try. Why be selfish? If you’re generous to your audience they’ll love you. You cannot improve or feel more comfortable with your talk unless you are prepared to talk to your walls. I do it all the time. I do it to perfect a new section. I do it to get the duration on target. I do it to know the presentation backwards and forwards. Practice makes perfect. There is no better way. I mostly practice in my home office and my priority is to shut out all the distractions. I close the door, pull the shades, turn off my phone and ask not to be interrupted for an hour. Once the presentation is ready, I set a timer, take a deep breath and give the presentation just as I would on stage. I walk around a bit. I use my hands and even look around the room with intention. Doing this alone feels funny at first, but it will give you the necessary skills to feel comfortable and know your talk well. Often, I’ll divide my talk into major buckets and then practice them independently. I have a target duration for each section and will practice a single section until I get it right. This way, I can iterate quickly on a specific set of points instead of trying to time-out the entire 45 minutes at once. Every time you step on that stage, you learn something new. It builds your confidence like nothing else can. I encourage you to find people in your life who can watch you practice and give you feedback. Consider finding a coach or a trusted advisor. They will see and hear things you don’t. Sachi has made my talks immeasurably better. It can also be helpful to use your computer’s webcam to record yourself practicing. Watching it can be a little weird and sometimes painful, but it has real value. You’ll quickly notice things like how often you say “umm”. So now you have an amazing new talk. Presumably, you have an event in mind for this talk. Or, you plan to be hired for events. That means you’ll work with event organizers. This is an opportunity for you to not only be a speaker, but a professional in every sense of the word. When people want to hire you to speak, it is an honor — you should treat it as such. Very few people are asked to share their expertise on stage. The person who contacted you will likely want to have a call to talk about your potential involvement and share some details about the event. Ask questions. Learn who will be in attendance, where they’re from and what issues they face. Ask about their job titles and current events. Ask about event attire so you can plan to fit in properly. Be prepared. Event organizers will want to know about the specifics of your talk. Make sure it has a title and specific take-home points. What will the audience learn? Most organizers want a speaker who can inspire their audience and/or give them specific/actionable things they can do to improve. Have these points ready, so you can speak confidently about yourself and your talk. As an understanding of expectations comes together, there will still be some ambiguity. 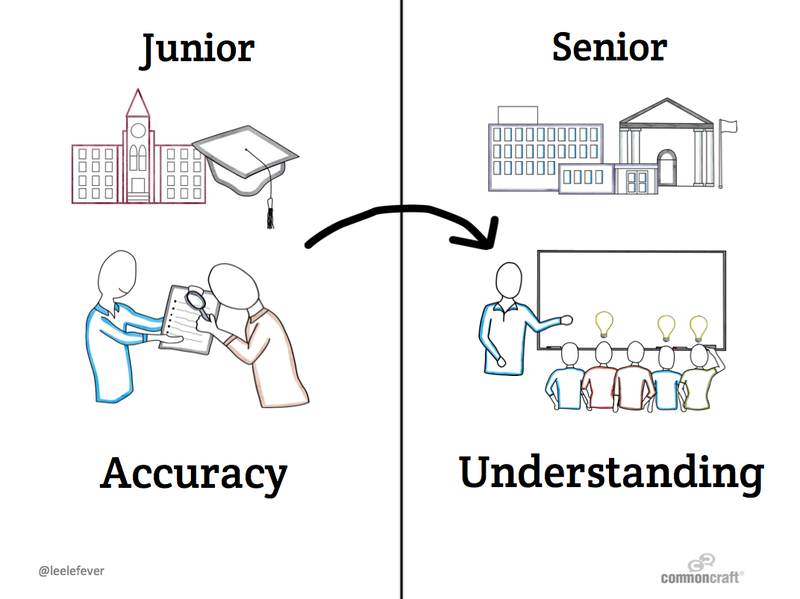 It’s to your advantage to reduce or eliminate ambiguity wherever possible. The agreement gives everyone clear expectations. Some organizers will have their own agreement. If you have requirements not mentioned in their standard agreement, work with them to have these included so everyone is on the same page. Once a speaker’s agreement is signed, you are on your way. You are now a public speaker! A high resolution headshot — This should be a clear, nice looking picture of your head to your shoulders. Ask a friend to take one for you. Save versions in large standard formats (.JPG, PNG, etc.) for future events. A bio — This should describe your experience and accomplishments. They are used to attract people to your session and to the conference in general. It may be important to ask how the bios will be used. Often, bios are used to introduce you before you come on stage. This may be a different bio than you provide for marketing. Be clear about where they will be used. Consider creating a Media Kit for your website that provides everything the organizer needs in one place. Planning and executing events is stressful. Always keep in mind that your event organizer is working hard on an event and is likely under significant stress. You are one part of a long checklist this person is juggling. Do everything you can to make your participation run smoothly and stress-free for them. This means adopting an attentive customer service orientation. Your contact may want to work with you on content and may ask if the talk can be customized for their audience. It is part of your job to make this happen. It doesn’t mean reworking your entire talk. Often, it simply means understanding who is in the audience and what they need. Your contact will know job titles and hot topics. Ask questions and listen to their answers carefully. For me, this might mean changing the examples I use in my talk. For an audience of educators, I provide examples that are focused on working with students in the classroom. If it’s a technology or business conference, my examples switch to customers, teams and products. This is essential because it will keep your audience’s attention. You want them to hear an example and say “he knows me” or “this is about my job”. The event is likely to have a theme and this may provide a starting point for you. I completed a series of keynotes across regions of a single organization recently and the theme for all of them was “Bridging the Conversation”. Knowing this, I found ways to use a bridge as a metaphor for better explanations. They loved it. Over time, you’ll develop a process and set of items that go with you on every speaking trip. Getting them right can be a good way to CYA. As a professional speaker, you should have a set of items that are with you at every speaking event. You may not use them all, but they can save you if plans change. You may not need either, depending on the the audio-visual setup. Some AV teams may provide a clicker. Be sure to test it before going on stage. Of course, these small parts are easy to lose when you are constantly handing them off to other teams. A tip I received from my friend Drew Keller was to use a label maker to label everything with your name and contact information. Another point outlined in my speaker’s agreement is that my presentation includes audio and video. This is important because not every speaking setup is prepared for this requirement and without audio, some of my most important examples will not work. Smaller events may not have this capability, so plan ahead. I’ve brought my own Bluetooth speaker to events just to be sure. Weather can complicate travel. On more than one occasion, I proactively changed my travel plans to ensure my availability at an event. In a few cases, there were impending snowstorms and I chose to arrive a day early to beat the storm. For another event, my train was cancelled due to an accident on the tracks that morning and I ended up taking BoltBus and getting there about the same time. Be aware of potential disruptions and remain flexible. If one mode of transportation fails, there may be a train, bus or rental car that can work for you. If the event involves air travel, I plan to arrive the night before the speaking event. This gives me a buffer so that flights can be late and not keep me from arriving on-time at the event. When you arrive on the premises, text or email your contacts to let them know you are in town and looking forward to meeting them the next day. It will help them sleep better knowing they can check off that box. Use time in your hotel room to prepare and practice. 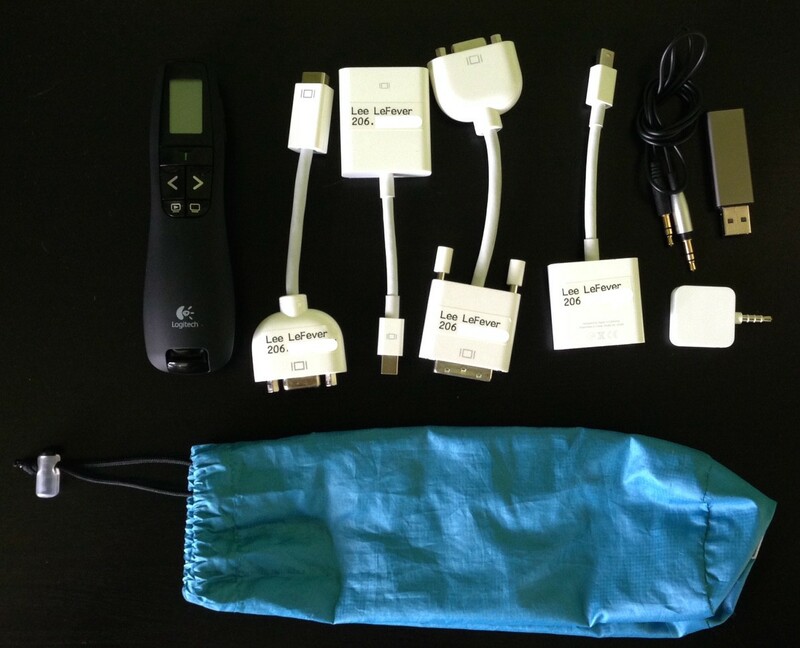 Go through your materials and make sure you have your cords, dongles, clickers, etc. You still have time to recover if something is missing. Go through your talk at least once in the hotel room and make any last minute changes. Try to get a good night’s sleep and wake up with plenty of time to prepare before the event. Before the event starts, be clear what time you should arrive at the event and with whom you will meet initially. Often, the first priority is a sound check. This means connecting your laptop to the projection and sound systems and testing it before attendees arrive in the room. It’s a good time to make sure media plays correctly, the clicker works and everything is formatted properly. Because you have a speaker’s agreement, you should have a clear picture of how everything will work. For example, I prefer to speak with a lavalier mic so I can move freely around the stage. Further, I require that the presentation run directly from my computer versus a USB drive or another computer. This is because my presentation has a lot of media and animations that are essential to my talk. Running from my laptop means I know they will work as intended. As I mentioned, I like using lavalier mics and the event organizers will be responsible for the microphone situation, if it is needed. 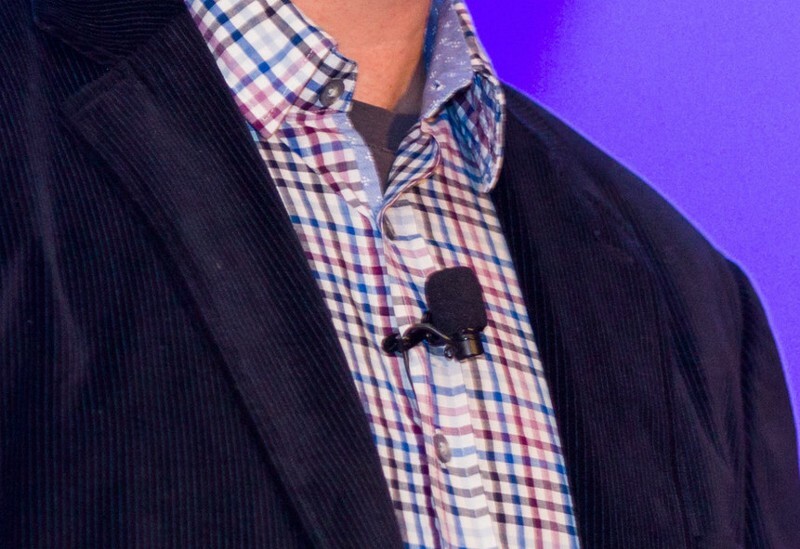 This lavalier setup means there is a small mic clipped onto your shirt with a wire that leads to a clip-on box about the size of a deck of cards that communicates wirelessly to the speaker system. The box is usually clipped onto your back pocket or onto your belt. The wire is not visible, but tucked into the shirt. To look professional, hide the wire by feeding it under your shirt and around to the box. This way the wire won’t get in the way as you move your hands. If you have a conference badge, remove it before taking the stage and turn off your cell phone. You may also encounter a podium with a built-in microphone or a handheld mic. You should be prepared to use any of these options. But remember, because you planned ahead and had a speaker’s agreement, the microphone setup should never be a surprise. 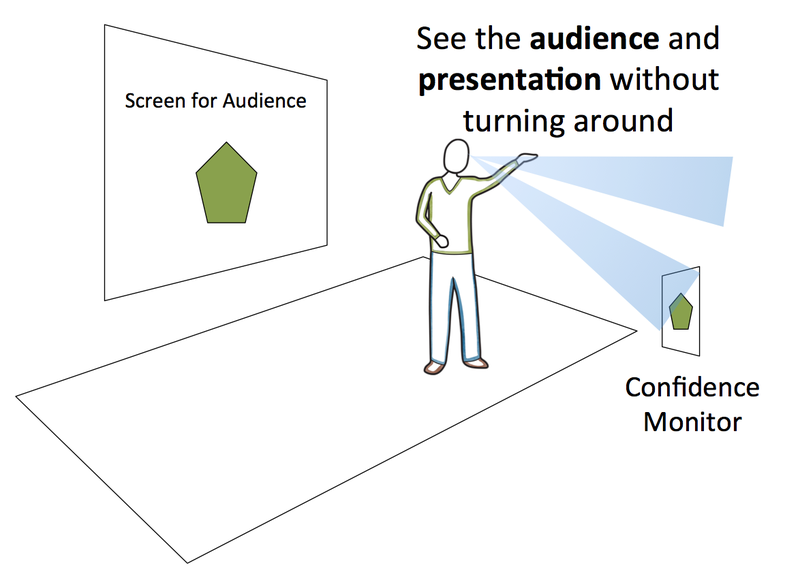 When on stage, your presentation will likely be displayed in a location that is facing the audience. This means the only way to see your slides is to turn around. This doesn’t work very well and doesn’t look professional. 1. You’ll have your laptop on the podium in front of you. 2. There will be a monitor(s) facing you that matches what the audience sees. These are called “confidence monitors”. In the best case scenario, for me at least, I can present using the “Presenter View” format in PowerPoint that shows me the timing and what slide is coming next. It’s not always possible to have it on confidence monitors, but it’s worth asking about. You should make it a goal to never touch your computer, even if it is right in front of you. Professional speakers use a clicker instead so the slides and animations magically and invisibly advance. This becomes more difficult when you need to play video or audio by manually clicking a play button on the screen. Taking this action stops the flow of the talk. You can do better. 1. “On Click” — you must go over to the computer and click “play”. 2. “Automatic” — as soon as the slide appears, it starts playing. Here’s the problem: It can be jarring to the audience if you go from a previous point directly into a video that plays immediately. To make the transition easier for the audience, It’s best to introduce the media using a visual representation of it on the screen, then play it. So, here’s the trick. Take a screenshot of the first frame of the video and insert it on a slide before the video slide. This way, you can display the screenshot, talk about what is coming, and then simply advance the slide to have the video play automatically. You never have to touch the computer and everything appears seamlessly. It works every time. Like so many speakers, one of my biggest issues in speaking was speed. My anxiety and nervous energy used to cause me to speed through the slides. I’ve been working on slowing this down for years and I finally have it under control. Like everything else, it takes practice, practice, (pause) practice. As Scott Berkun notes in Confessions of a Public Speaker, the pauses that seem too long to you won’t be noticed by the crowd. What seems like an eternity on stage will actually be welcomed by the audience. That’s because they are taking in a lot of information at once. By taking intentional pauses, you can give them time to digest your points. It’s perfectly fine to stop and take a drink of water. Take a deep breath. Walk to another section of the stage. Think of this as a release valve that allows everyone, including you, to relax and reset. Attendees and organizers will sometimes request copies of your presentation. Some would love to use videos or visuals you used. If you are okay sharing, I encourage you to create a web page on your website that contains these resources and display a link at the end of your talk that connects your audience to the resources. First, it offers them a self-service opportunity to access unique content. Second, it provides an easy way to get them to your website where you can introduce them to what you do. People love it. As a speaker, you may be invited to various events surrounding the conference. This might include dinner the night before with the organizers or breakfast with the leadership team. When I can, I accept these invitations. It’s a great way to develop rapport and get a better understanding of the audience. It can also help you feel more confident and help them feel more connected to you. Keep in mind that many speakers are in-and-out of the event quickly. While it’s nice to connect, there is not usually an expectation that you will stay to watch other speakers or do other activities. For many speakers, it comes down to scheduling constraints. As a speaker, you should always be improving your talk. After the event is over, contact your organizer and ask for direct feedback. If the attendees were surveyed, ask for the results. You should also consider asking for a testimonial; something you can use on your website to promote your services. I had a recent engagement that took me to five regions for a specific organization over a month. The organization that handled the stage setup and audio-visuals were also “on tour” and I asked them for advice they would give to speakers that would help things go more smoothly. They said that the most destructive thing a speaker can do, from their perspective, is to treat people around them with little respect. They told multiple stories of speakers who arrive late, throw down their laptop and run onto stage — and then blame problems on the staff. It throws the entire event into disarray when a speaker makes unreasonable demands at the last minute or doesn’t realize how their own lack of preparation is causing problems. It can be painful for everyone. You can do better. Keep in mind that the staff and audio/visual team are there to make you look good. They want to help you to knock it out of the park and the best thing you can do is be a professional. Be prepared, communicate clearly and show respect for the people who are there to help you succeed. Public speaking is an honor that comes with responsibility. 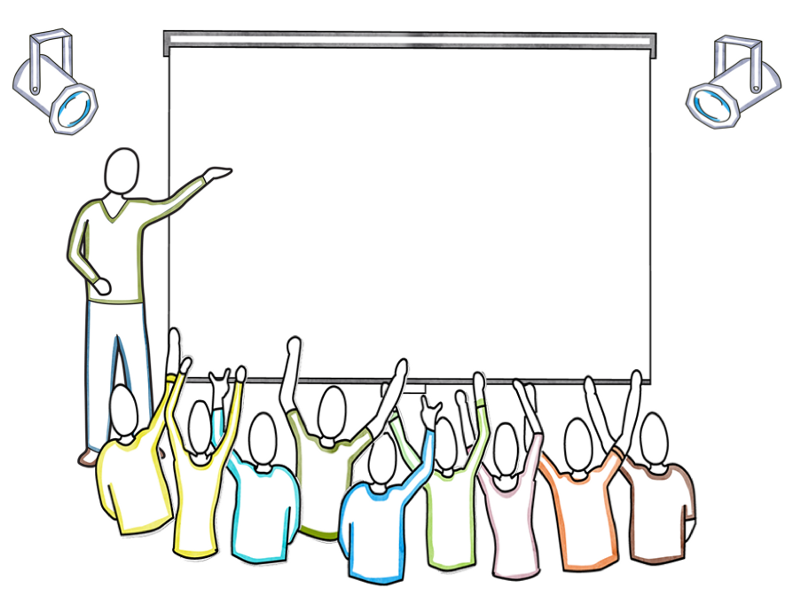 As a speaker, you are a part of a team and have a role to play in the entire team’s success. You only have one chance to knock an audience’s socks off. You accomplish this by being a great presenter, but also through being prepared — REALLY prepared. And by focusing on professionalism and service, you can not only impress and inspire hundreds or thousands of people, but also build relationships with event organizers that can lead to more speaking events in the future. 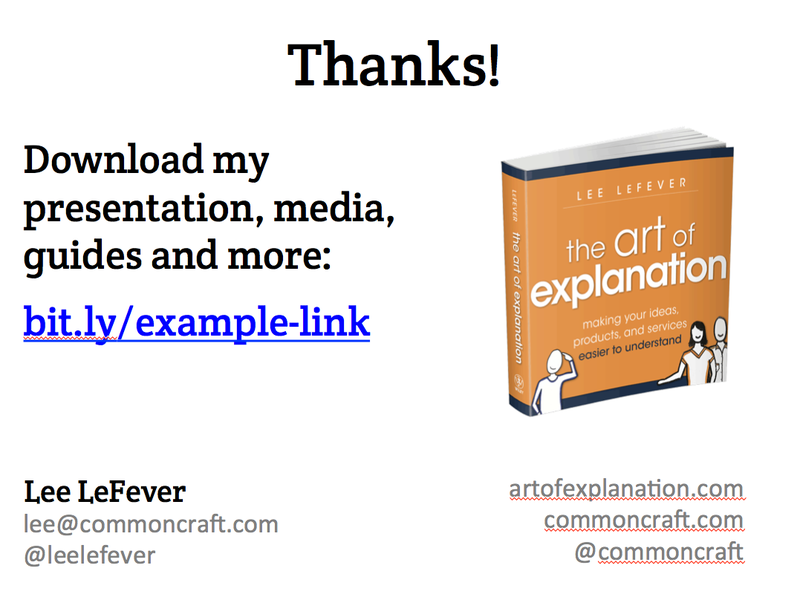 Lee LeFever is the co-founder of Common Craft and author of The Art of Explanation. Lee is known for Common Craft’s animated explainer videos, which have been viewed over 50 million times online and helped introduce products like Twitter and Dropbox. Today, Common Craft licenses original videos for use in education in over 50 countries. Lee lives in Seattle with his wife and co-founder Sachi. Find our more about his speaking here. Explainer at heart. Communicator in action. Merry-maker in spirit.